Treponema pallidum (T. pallidum), a spirochete bacterium, is the causative agent of the venereal disease syphilis, a chronic human disease predominantly transmitted via sexual contact but may also occur between an infected mother and fetus. During 2015, there were over 24,000 primary and secondary cases reported for syphilis, compared to approximately 40,000 people diagnosed with HIV infection in the USA (CDC, 2016). Both Tp47 and Tp17 are T. pallidum highly immunogenic outer membrane lipoproteins and are potent markers for the serological detection of syphilis, as both can react strongly to human anti-syphilis antibody positive sera. 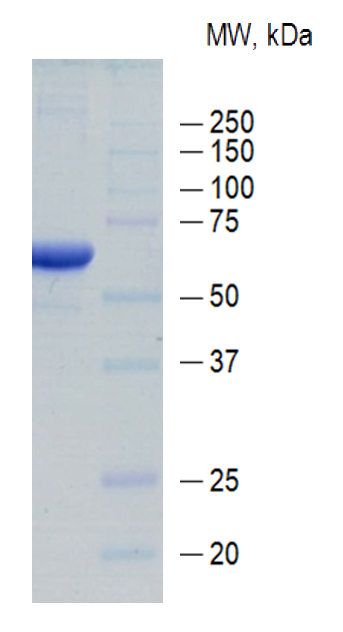 A4717 is composed of the full length sequences of Tp17 and Tp47, expressed in E. coli and purified with affinity chromatography. Application Coating antigen in ICT and ELISA, Paring with A0017. Get valuable IVD news, tips, and expertise from CTK.